Place the baby cos leaves, red onion, parsley, dill, lemon juice and olive oil in a large serving bowl. Toss to combine and set aside in the fridge. Cut the potatoes into 5mm sticks, and soak in cold water for 15 minutes. Drain the potatoes, and add to a large pot filled with cold water. Place over high heat and bring to the boil. Once boiling, cook for 5 minutes before draining the potatoes. Spread the potatoes over paper towel, and pat dry. Place a large saucepan (approximately 20cm diameter) onto the stovetop, and half fill with cooking oil. Turn the heat to high, and heat for five minutes. To test if the oil is ready for frying, add a chip to the oil. The chip should gently bubble. If there isn’t any bubbling, the oil is too cold. Once the oil is ready, add half of the chips. Cook for 5-6 minutes, or until crisp. Place the chips in a large bowl with paper towel, and sprinkle with salt. Continue with the remaining chips. As the chips are cooking, on a large plate add ¼ cup of the flour, and a big pinch of salt and pepper. Mix to combine, before tossing the flake in the seasoned flour. In a medium sized bowl, add the beer and soda water. Slowly rain the remaining flour into the beer, while stirring constantly with a whisk. Turn the heat to medium. Dip the floured flake into the batter, and carefully place into the oil. Cook two or three pieces at a time, for 3 minutes each. Remove the flake from the oil and place onto a plate with paper towel to drain. 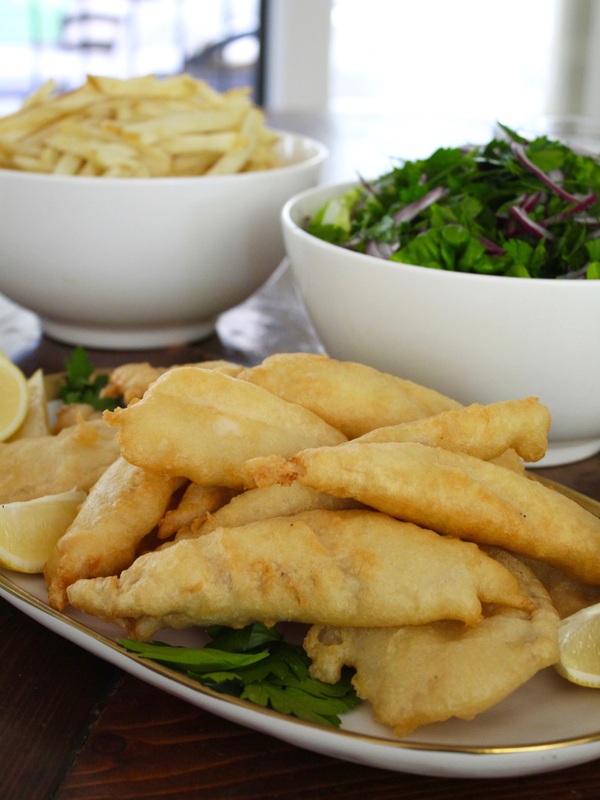 Place the homemade chips onto serving plates with the beer battered flake and baby cos salad to serve.